The call flow itself is quite standard SIP session. The protocol which is used for the data transmition is MSRP. Note that in contrast to RTP (e.g. in VoLTE) the MSRP goes from A-SBC to RCS Application Server. That’s because of the possible interworking with legacy network or because of other messaging services. This doesn’t usually apply to data (Application/3gpp-ims+xml), which is not intercepted by RCS server, or which can be sent using http protocol via Content Server (http is the only option in RCS UP). As in VoLTE, also in RCS we apply both originating and terminating services. Notifications are transferred as standard messages. To find out if the MSRP message is notification or not, we have to firstly decode the CPIM Message. Note that SIP MESSAGE method is needed for notifications before the session is established as the INVITE can contain the first message already. Definitely there will be other posts with more details. The RCS Universal Profile does use only the Session Mode for Advanced Messaging service. Pager mode or Standalone messaging is based on OMA SIMPLE IM or OMA CPM. In this case no session is established and it depends on a client how it will interpret. 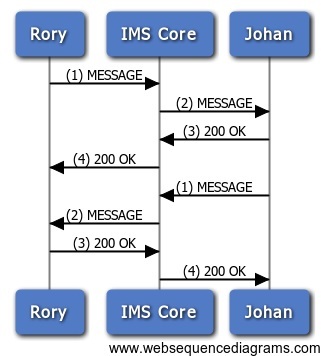 In Pager mode SIP MESSAGE method is used for the message transfer. The Pager mode used to be a preferred variant for some time. Each notification is sent as a new SIP MESSAGE. In case of a large message it is also possible to establish a session. The mechanism is known as a Large Message Mode Messaging. This SIP session should not be confused with Session Mode Messaging as no IM session is established. The SIP session is only used to transmit exactly one large message after which the SIP session is torn down. The limit for the messages using the SIP MESSAGE method is set to a maximum size of 1300 bytes. Messages exceeding this limit are delivered in Large Message Mode. For both Session mode and Pager mode a seamless fallback into 3G network is available. The application server providing the functionality is called Service layer IP-SM-GW. Finally it is also possible to send a traditional SMS over SIP protocol (SMSoIP). Originally was expected that 4G telephones will generate the same payload (SMS) and based on active network they’ll submit them either in 3G as classical SMS or in 4G as a SIP MESSAGE. The content of the SIP MESSAGE is the SM-RP (24.011 – SM Relay protocol) and SMS (23.040 – SMS). It means the content of the massage is binary. 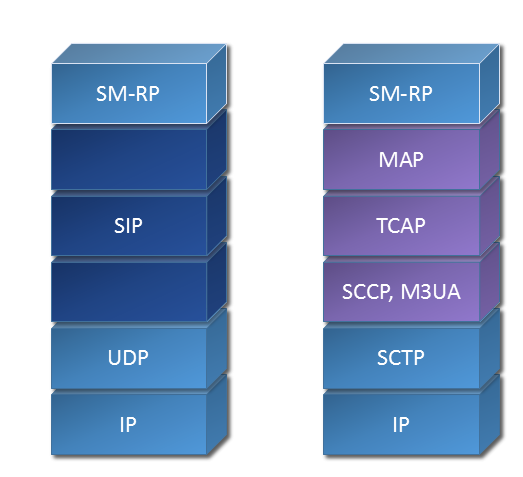 The application server in IMS network responsible for SMSoIP is a Transport layer IP-SM-GW. 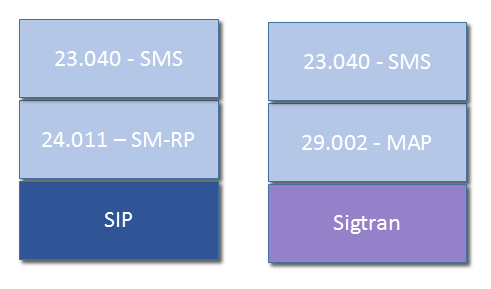 According the specification 3GPP TS24.341 IP-SM-GW can translate SIP protocol in Sigtran and vice versa. In real life also other protocols as SMPP or Diameter can be used instead of Sigtran. More details can be found in the post about the Transport Level Interworking. For the service standard definition check out the latest GSMA RCS Implementation Guidelines. This entry was posted in IMS, IPSMGW, Messaging, RCS and tagged msrp, rcs messaging. Bookmark the permalink. publish, we want work out more techniques on this regard, thanks for sharing. Thank you so much for this!! I work in the field, and we implement RCS/MSRP for Verizon and this made the call flows much easier to understand! Thank you for the comment. Hope I’ll find time to add more information. Seriously you’re website here is a wealth of information, and it caters almost perfectly to my job and work. Any chance you’ll cover H248/Megaco signaling? Also have you thought about doing a series of posts breaking down wireshark call flows? As for the pcaps – yes – this is what I tried to do e.g. in https://realtimecommunication.wordpress.com/2015/09/07/how-to-read-tcpdump-registration/ or in https://realtimecommunication.wordpress.com/sip-illustrated-sip-by-sip/. I plan to go through some nice traces of early-media or Supp Services. Would you have some interesting trace, don’t hesitate to send me it, I’ll anonymize and post. Again the biggest issue is the time. Wow, I didn’t even see these two posts before… Are you sure you haven’t missed your calling and should be a like a professor at MIT or something?? You’re posts are not only thorough and deep, but of some of the best quality I’ve seen… Far far more digestable and readable than the RFC’s and white papers. Thank you immensely. I may message you via email and send you a trace or two so you can take a peek, of course in your free time!